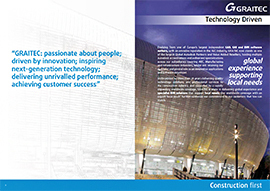 Online presentation: ADVANCE Concrete – the high-end concrete detailing software ! Discover the high-end concrete detailing software ! Advance Concrete® is specifically designed for structural engineers and reinforced concrete detailers who require professional and easy-to-use BIM software that automates the production of drawings, BOMs and NC files. Advance Concrete® drastically increases productivity and drawing quality, while reducing the risk of errors. Perfectly integrated in AutoCAD®, Advance Concrete® accelerates the design phase (single or multi-user mode) by offering an extensive library of structural and reinforcement elements. It generates all construction drawings using intelligent drawing tools automatically controlling dimensions, symbols and drawing layout.Advance Concrete® is part of the GRAITEC structural BIM solution, automating the entire structural design process, from engineering design to detailing and fabrication. With Version 2012, significant work was done reworking the software architecture and optimizing performance. This results in a significantly higher ease of use and increased efficiency for users. Version 2012 also improves rebar detailers efficiency with improved tools for placing rebars and fabrics in identical elements, new options for visual representation and better control of elements as well as new Bill Of Material options. Advance Concrete 2102 also has much better interoperability thanks to several new features such as DWG export in batch and improved DWF export. ← Another winning performance at the Allianz Arena!